Carol's Theatre Reviews ~ It's Fun To Go Out: “This Beautiful City” Makes San Diego Premiere at Diversionary. 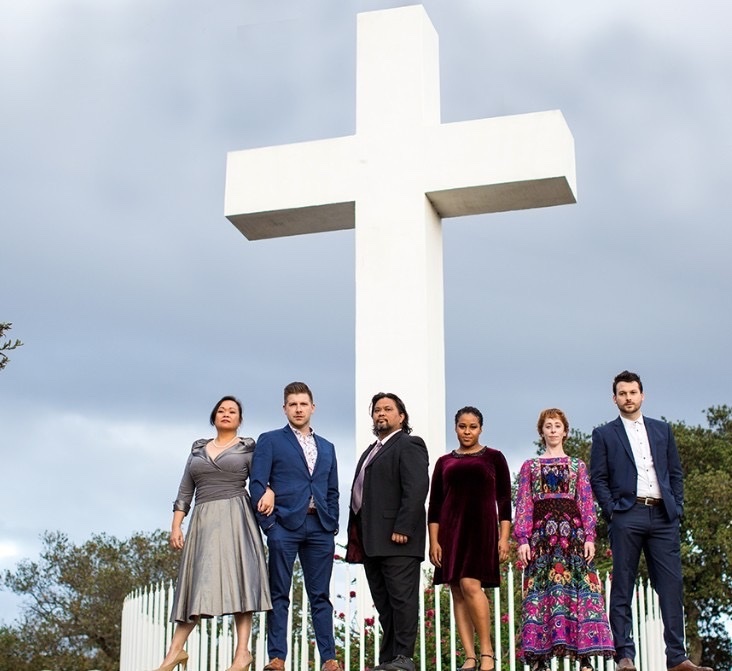 “This Beautiful City” Makes San Diego Premiere at Diversionary. 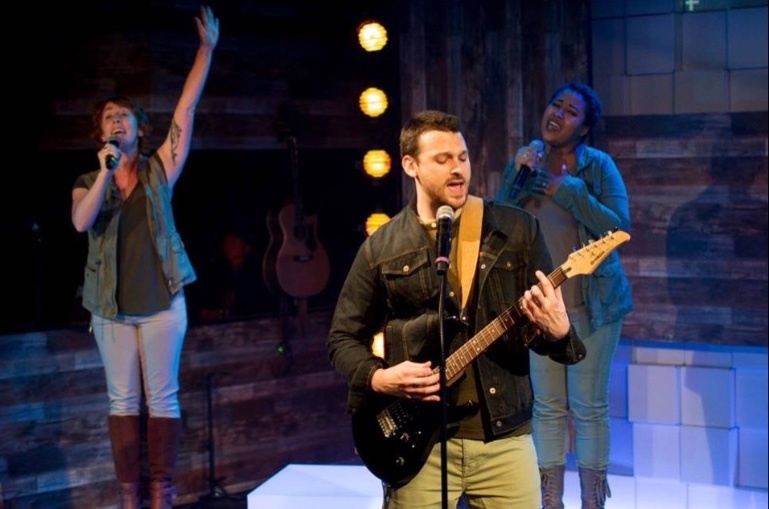 “This Beautiful City” the docu-musical ‘created from actual interviews with citizens of Colorado Springs, Co. the capitol of the Evangelical movement’ is the current fare at Diversionary Theatre in University Heights. As one of the oldest LGBT theatre's, Diversionary has been thriving for 33 years in what is/has been referred to as ‘America’s Finest City. Cast of "This Beautiful City"
Artistic director Matt Morrow (one of our finest) has dusted off this eighteen- year old piece that is as relevant today as it was then; gathered together an outstanding cast of actors/musicians and is forging full speed ahead in highlighting a series of conversations and interviews from the good folk in Colorado Springs. Those interviewed consist of believers, non-believers, gay, young, old, trans, disenfranchised, white, black, converts, and every one between. Both town and residents were on notice and all had their say. The interviews took place in 2006. Emily Ackerman, Marsha Stephanie Blake, Brad Heberlee, Stephen Plunkett, Allison Weller conducted the interviews. The play “This Beautiful City” is the end result of their labor that is now enjoying a somewhat satisfying, albeit too long, production at the University Heights theatre with a cast of six terrific actors playing more than a dozen or more of those selected. Created by The Civilians, and written by Steven Cosson and Jim Lewis, with music and lyrics by Michael Friedman (“Take Me There”) the music translates well into the dialogue of the interviews. Between score and some spoken monologues, the piece does have a certain appeal. And so it begins as to the how, the why and the what of Colorado Springs, ‘a gorgeous city…and a wonderful place to sell’, that started out as an experiment by a woman (Kim Heil) whose husband was transferred from Detroit to Colorado Springs and she became a transplant herself. Her expertise was economic development; her calling to recruit about fifteen non-profit Christian evangelical organizations came down from the heavens, as the word of God. She recruited two to three employees from several small evangelical groups. That was the beginning, twenty-two years ago. By the time this experiment took place and now, four had amassed revenues of over one hundred million dollars. (“If God was using me to make this city the evangelical capitol, I didn’t know it at the time”). The Citizens Group got more than they bargained for in their interviews including the downfall of New Life Church’s founding (hypocrite) Pastor Ted Haggard, those experiencing drugs, gay rights, the non religious, a former drug addict, the old, the young and of course, the faithful. With all six in the ensemble (three male and three female) playing multiple roles telling their stories and singing the original lyrics, the play I want to say hums along, but hits a few snags with too much repetition and some unnecessary details. The interviewees represent a diversity and not just evangelical, of residents eager to spin their respective tales. All are up to the task. We first meet up with Kim Heil persuasive as the woman who started this whole migration. She also plays the fairness leader and RHOP member. Theo Allyn is flawless as the young woman who is an atheist activist defending her Dad, who as it turns out comes out. She’s wonderfully authentic. 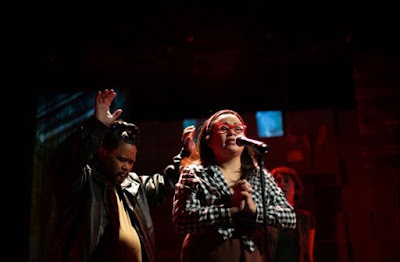 Jasmine January is another multi-talented young woman whose roles change from Baptist minister to a senior in the church to Air Force cadet and others. Michael Louis Cusimano portrays the fallen Ted Haggard and in an excellent turn about as he also plays Youth Pastor, Air Force Cadet and others while strumming his guitar. The ever-effervescent and diverse Tony Houck, musical director and part of the town’s conversation, plays several folks including church leader, Alt writer, RHOP leader and others. 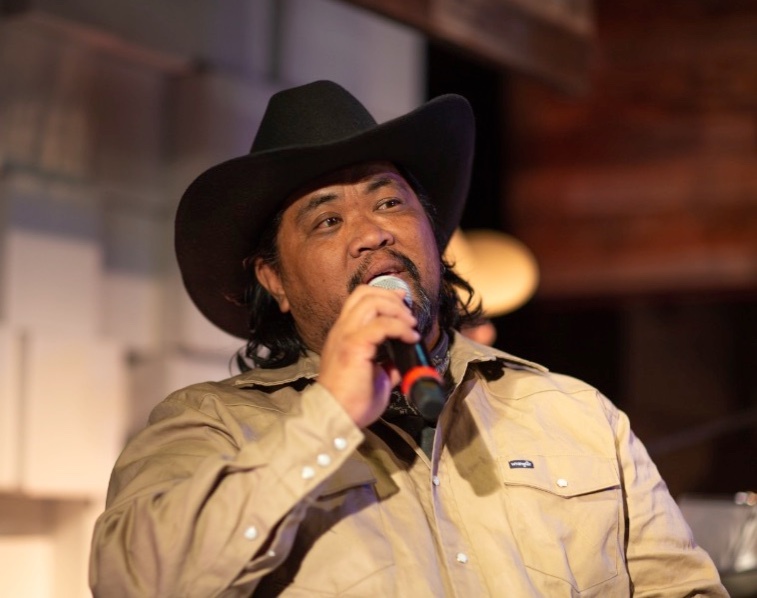 Victor E. Chan is part of the Colorado Wranglers, the singing group “It’s A Long Road To Colorado”. He also shows the most anger in those interviewed as an Air Force parent, and a publisher who rails against the church establishment. Justin Humphries designed the multipurpose set, Blake McCarty projections and Curtis Mueller the lighting. “This Beautiful City” was an eye opener to yours truly. I have always been rather cynical about the ‘holier than thou’s who think it’s their way or the highway. Unfortunately this piece, while poking fun along with the running dialogue, also reinforced my convictions. This past political year cemented them. When religion takes itself out of my life, I’ll be a happy camper. PS Composer ("Blood Bloody Andrew Jackson") Michael Friedman passed way in 2017 of complications related to HIV/AIDS.